The final months of the International Geophysical Year of 1957–1958 were a period when the political and scientific future of the Antarctic was being shaped, with many of the participating countries reassessing their policies regarding the South Polar region. 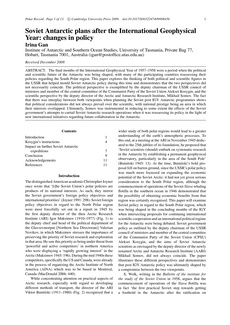 This paper explores the thinking of both political and scientific figures in the USSR that helped mould Soviet Antarctic policy during this time and demonstrates that the two perspectives did not necessarily coincide. The political perspective is exemplified by the deputy chairman of the USSR council of ministers and member of the central committee of the Communist Party of the Soviet Union Aleksei Kosygin, and the scientific perspective by the deputy director of the Arctic and Antarctic Research Institute, Mikhail Somov. The fact that there was interplay between both viewpoints when planning the Soviet post IGY Antarctic programmes shows that political considerations did not always prevail over the scientific, with national prestige being an area in which their interests overlapped. Ultimately, Somov was instrumental in reducing to some extent the effects of the Soviet government’s attempts to curtail Soviet Antarctic research operations when it was reassessing its policy in the light of new international initiatives regarding future collaboration in the Antarctic.